The second sitting was a bit rough as we were down three of five players. This left Caldus, Bridgette, and Edward on autopilot. 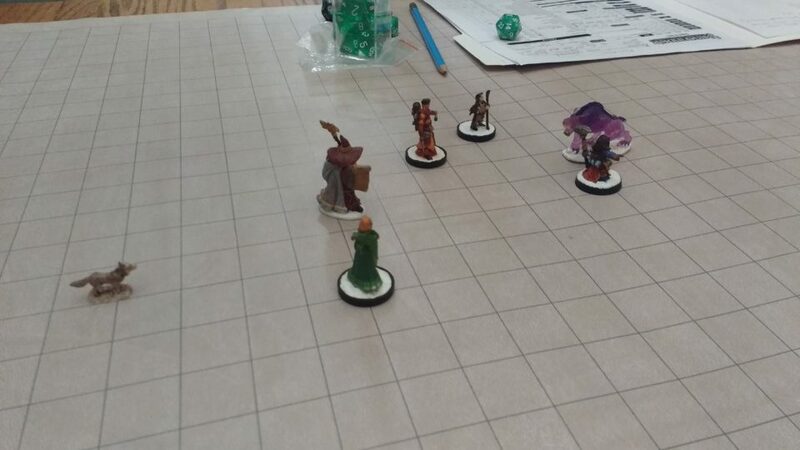 The sitting began with the citizens of Lonepine related to the party giving them items to help them on their journey – cookies of cure light wounds, magical fire arrows, potions, and so on. Caldus then scouted ahead while the rest of the group followed. 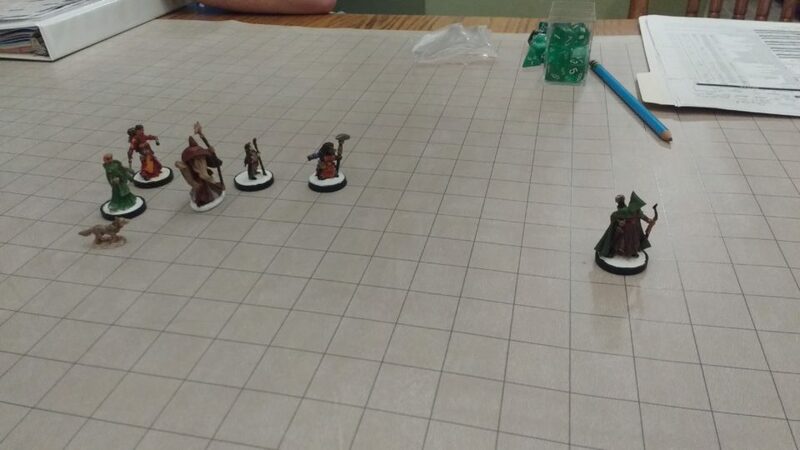 The group fought one of the mysterious hounds on their own. 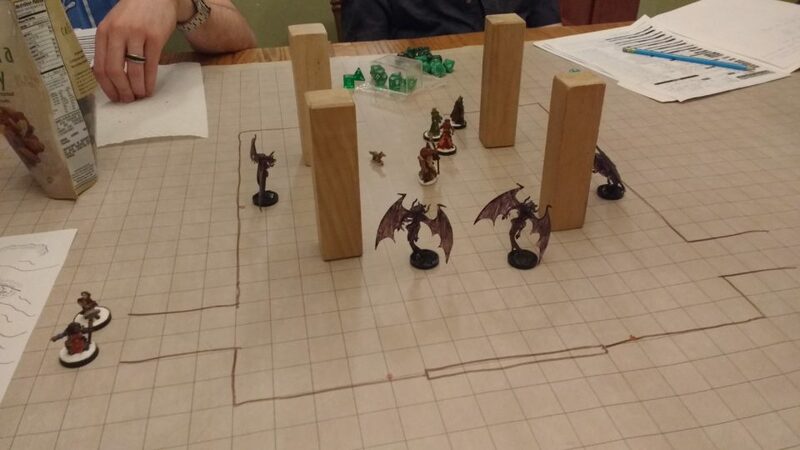 We actually skipped combat due to the low turnout but ruled that it was a tough fight. After a difficult journey through the northern reaches of the valley the group arrived at the entrance to Ernhardur’s Sanctum. 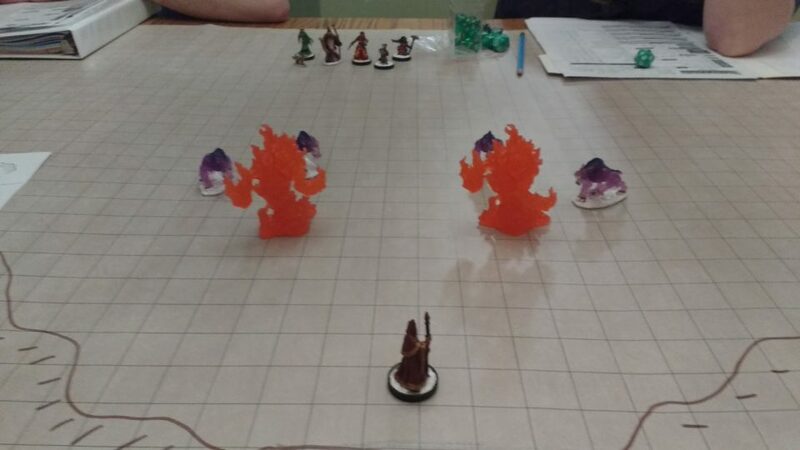 Here, at the base of the tallest mountain in the region, they discovered a pair of fiery elementals fighting off more of the sinister hounds. A female elf, wearing the robes of an acolyte of Ernhardur, stood by the sanctum doors leading to the interior of the mountain. 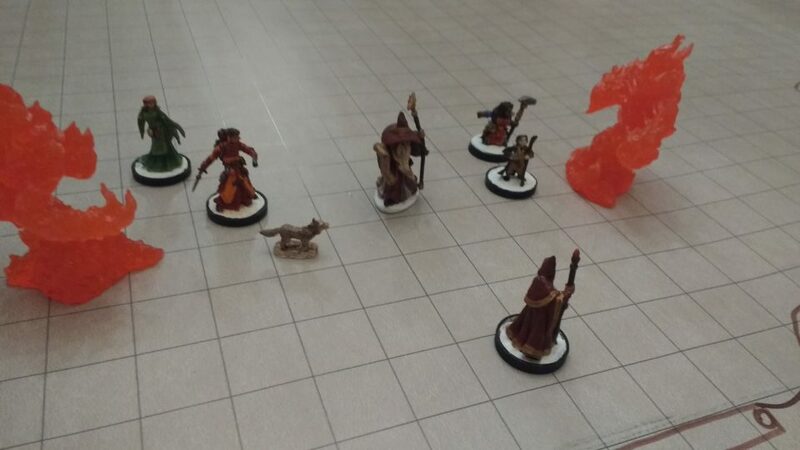 Aiding in the fight – again on autocombat – the group quickly dispatched the sinister hounds with the aid of the fiery elementals. They recognized the elf as Sothiel – a native of the valley who had been ‘sacrificed’ into Ernhardur’s service several decades ago. The group learns that she was took over guard duty at the entrance three days ago and was never relieved. Wounded and exhausted, she expressed great concern as to why no acolyte came to relieve her but refused to abandon her post. She shared that Ernhardur had “passed beyond the Observatory” a fortnight ago and that the acolytes had been forbidden to follow. The sinister forces began to attack about a week ago. Agamemnon attempts to dominate the discussion but it is Spazzlethrop who manages to win Sothiel’s trust by healing her injuries. Meanwhile, Kendra occupies herself by melting various metals in the fiery elementals in order to determine just how hot they are. Granted entrance to the sanctum by Sothiel, the group finds themselves in a large chamber that seems to have been formed seamlessly out of the mountain. Kendra, being a dwarf, is fascinated by this but no one else really seems to take notice. There are two corridors leading off from this chamber, each clearly carved by mortal hands, as well as a great golden door engraved with the likeliness of a dragon. The golden door is hot to the touch and refuses to open. The group is soon ambushed by winged fiends that display many of the same properties of the hounds but who take full advantage of their flight with hit & run tactics. 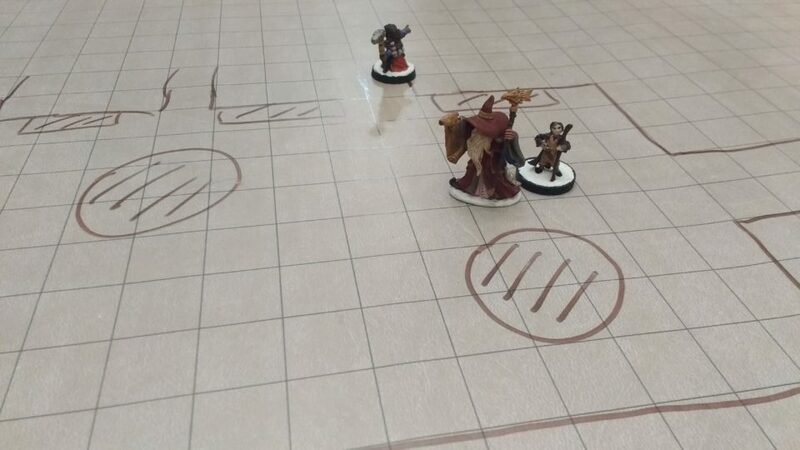 This was another autocombat that ended with Kendra, Spazzlethrop, and Agamemnon fleeing down on of the corridors while the others bravely guarded their retreat. The corridors lead to the acolyte quarters, again clearly carved from the mountain by normal means, where the two had a confrontation with Agamemnon. Ask them for the details. 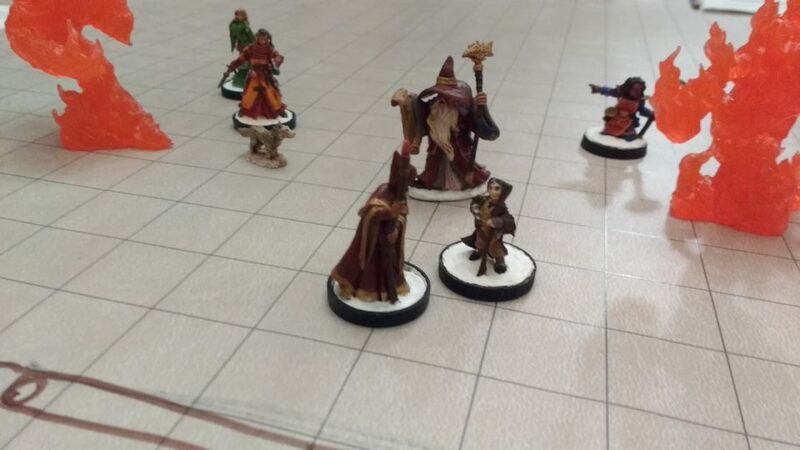 They also – this was retconned in as the DM forgot at the time – found the dairy of a halfling acolyte named Faron who mentioned several secret passages including one that led into the Observatory. Spazzlethrop picked up a couple of books – one on herbalism and one on mechanical devices. Agamemnon revealed a network of secret passages that lead deeper into the mountain. Apparently, the acolytes had carved these over generations in order to get around the mountain. Ernhardur used a central shaft to navigate between the chambers but the acolytes were forbidden from using it – so they had make passages for themselves including many hidden ones. 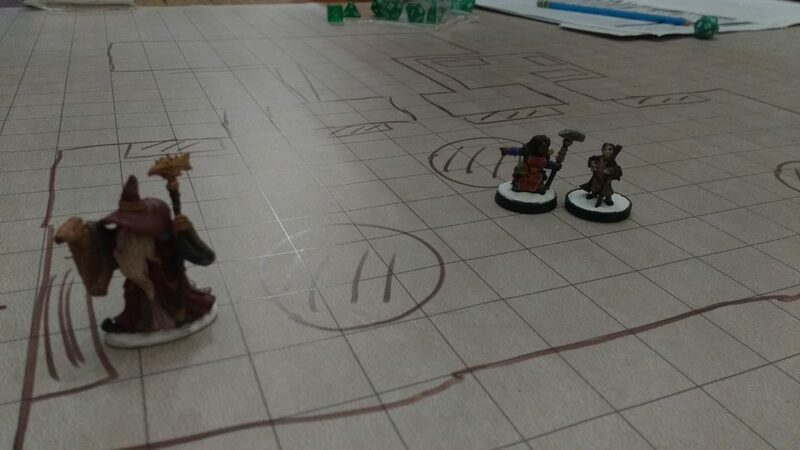 Kendra and Spazzlethrop passed several chambers in the mountain including the Menagerie (where they saw a treant), the Star Gate (a large sealed door decorated with constellations), the Celestial Orb chamber, and the Library (most of the books were awkwardly dragon sized). In the library they encountered a dwarf acolyte named Balthus and were reunited with their companions. Balthus shared that the sinister beings attacking the sanctum possessed the ability to phase through solid rock and, somehow, bypass the wards guarding the sanctum. The dwarf also noted that over the last several years Ernhardur had been increasingly obsessed with a ritual and a falling star. Balthus didn’t understand how or why, but Ernhardur somehow passed beyond the Observatory to find answers about these things. The entrance to the Observatory, located in the library, was sealed by powerful magic. It took some time but the group found the secret passage that Faron had noted. Agamemnon couldn’t manage to crawl through the halfling sized tunnel and was left behind. In the Observatory – a chamber filled with mechanical devices and lenses – the group found a great black portal. After a bit of debate they passed through it in order to find Ernhardur.